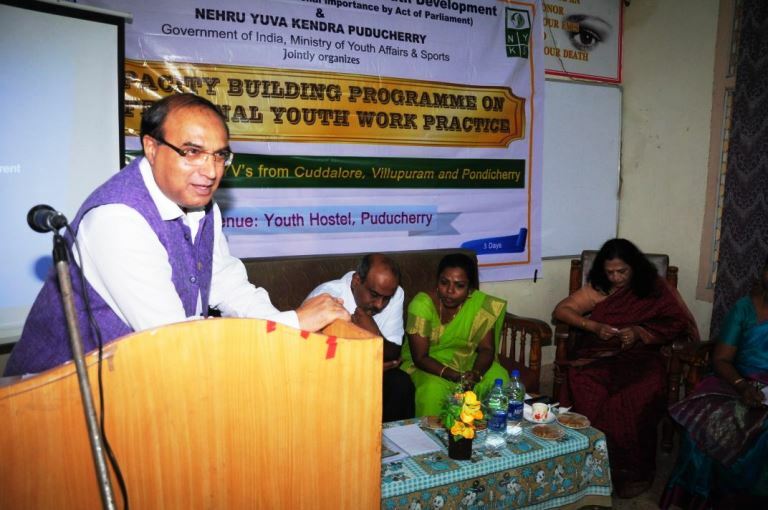 Sriperumbudur ,Dec 01 Rajiv Gandhi National Institute of Youth Development, An Institute of National Importance jointly organized a three days training programme on ‘Capacity Building Programme on Professional Youth Work Practice’ with Nehru Yuva Kendra, Puducherry which began today at Youth Hostel. While delivering the inaugural address Professor (Dr.) M.M. Goel, Director RGNIYD said that RGNIYD as an institution of national importance by the Act of Parliament has the mandate for empowerment of youth with devotion, dedication and determination to say no to conflict caused by discrimination, deprivation and discontent in democratic India by implementing national youth policy 2014 . The demoralized youth deserve to be motivated with enough employment scope for them outside India. To inspire them for entering the employment market, we have to identify their potential and train them in the skills of communication in English with spiritual input, justified Professor Goel who is an economist. For employability of youth, we need to increase return on training investment (ROTI) with communication skills, time management and spiritual input along with abilities of head and heart, skills and knowledge (ASK), told the Director RGNIYD. According to Professor Goel the essentials for youth empowerment in India are inherent in SMART (simple, moral, action oriented, responsive and transparent) model developed by him in the book “Economics of Human Resource Development in India (2012). We should prepare youth for the spirit of corporation and support in the present times of competition which is healthy as well as unhealthy. Spiritual awakening is necessary for empowerment of youth for which Bhagvad Gita needs to be incorporated in the manual of life skills for them, believes Director RGNIYD. Shri R. Radhakrishnan M.P and Shri S. Satheese Zonal Director, NYKS also spoke on the occasion.